My biggest complaint on this album is the repetitive drum beat. There is very little (if any) variation and very little speed, much like a slow, post Pyromania Def Leppard tune. However, Jamie St. James continues his charismatic delivery, complete with the occasional energetic wails. While St. James is again a shining point of the album, his balls to the wall vocal delivery magnifies the suddenly flat sounding drums. St. James seems to be forging ahead full steam while the songs themselves are stuck in low gear. There are still plenty of lively guitar solos to be found, but the crunchiness of the debut is all but gone at this point. If you are patient enough to sift through the generic and uneventful elements of this album, you will find some positive points to this album. Like I said, Jamie St. James energetic vocals save this album to a degree, as does the healthy dose of guitar soloing and shred work. Songs like Great Guns of Fire and The Snake are more reminiscent of the band's earlier work. The harmony vocals are again strong, and you will hear several catchy moments within most of the songs. It's just hard to listen to this album from beginning to end when you have that very basic (and slow) "thump-snare, thump-snare" drum beat for almost the entire album. Not exactly the strongest of albums to finish their career, In Heat could have been a lot better. Had the guys cranked up the tempo just a bit and given drummer Pete Holmes a couple cups of coffee, this album probably would have been much more exciting. A more lively rhythm section naturally provides the opportunity for a stronger rhythm guitar presence. Well, there is some nice shred work to be found, but the rhythm guitars are pretty much stuck in a standstill given the flat drumbeat. 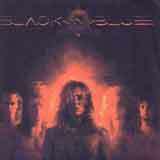 Apparently, Black 'n Blue has decided that In Heat will not be their fourth and FINAL studio album! The band has reformed and has recorded their FIFTH and forthcoming studio album, Hell Yeah. The album will be released on Z Records (Europe) and a sample track is available for download on their site. This track is very encouraging and if it is any indication of the entire album, it is safe to say that Black 'n Blue will recapture their glory days with the release of Hell Yeah. One notable item is that guitarist Tommy Thayer will not be participating in the recording of Hell Yeah due to current obligations with Kiss. He is being replaced by Shawn Sonnenschein. Needless to say, the Majestic Rock Records reissue of the band's first four albums and the announcement of their first studio album in about 15 years is terrific news for Black 'n Blue fans!